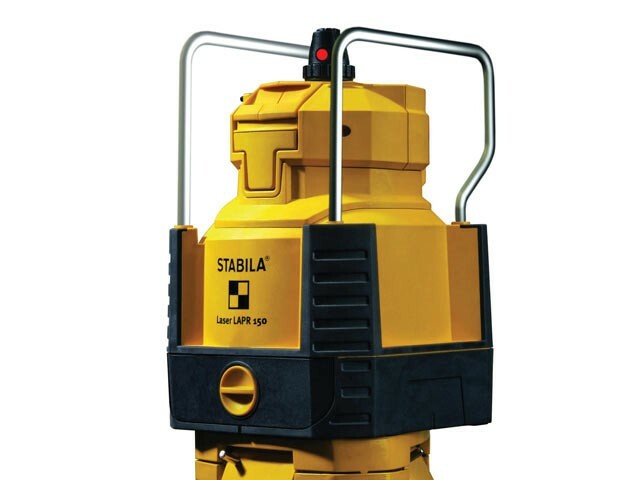 The Stabila LAPR 150 Self-Levelling Rotation Laser is quick, versatile and easy to use. Ideal for bricklayers and concrete construction workers. Levels much faster than a motor-powered rotation laser. Features the most important laser functions combined in one unit: rotation horizontally and vertically, three-stage scan, plumb line and 90° angle. No waiting time, with rapid self-levelling due to pendulum-technology compatible with any construction site. Easy to change from horizontal to vertical position, the complete prism unit is swivelled precisely by 90° in the guide channel. Protected in all positions thanks to its sturdy metal bows, shock-absorbing soft-grip casing and pendulum protected by forced locking for safe transportation. IP54 rated against splash and dust damage. Powered by two 1.5 Volt D Cell batteries, that are included, offering around 80 hours of operation. The battery drawer design makes it easy to replace dead batteries, even if mounted on a tripod. Accuracy: Horizontal: ±0.2mm, Vertical: ± 0.3mm. Working Range: 240m with Receiver. Input Power: 2 x 1.5 Volt D Cell Batteries (Included).